After dying for the last time on the stage of the Metropolitan Opera House, body limp on a cold slab of marble beside her Romeo, Julie Kent rose as she had countless times before to receive the audience's acclaim. As she stood there, surrounded by tearful colleagues and looking impossibly young in Juliet's wispy sheath, she gazed out with a mixture of sadness and gratitude, and perhaps a hint of disbelief. For many ballet-lovers, it's difficult to remember a time when Julie Kent wasn't dancing on that stage. She began her career at American Ballet Theatre in 1985, at 16, and starred alongside Baryshnikov in Dancers just two years later. After being promoted to principal in 1993, she went on to spend another 22 years at the company, dancing in works by everyone from Petipa to Twyla Tharp. “It was the most difficult, wonderful experience," she said recently of her retirement. But there has been little time to wallow. Soon after that final Juliet, she became the artistic director of ABT's summer intensives, a network of training programs that serves approximately 1,400 students each year. It seemed like a natural progression, one followed by many women: dancer, teacher, ballet mistress, coach. Ballet is an art sustained by women. But it is not a profession—at least not in this country—in which women tend to attain the very pinnacle of the hierarchy: the director's office. (Several companies, including the Boston and Pennsylvania Ballets, were started by women—and ABT was co-founded by one—but men have usually replaced them later on.) So it was doubly welcome when it was announced that Kent would be taking over The Washington Ballet starting this month, as a replacement for Septime Webre, who is leaving after 17 years to devote his time to making new works and teaching. The call came, out of the blue, late last year. At first, Kent balked. “I said, 'I'm really very happy with the position I have,' " she explains with a chuckle. She couldn't imagine walking away from a job she had just begun to explore, or, more importantly, uprooting her husband and two children, and leaving behind a close network of friends and colleagues. “I wasn't looking for a major change," she says. “I had already gone through that by ending my performing career." The Washington Ballet search committee persisted. Eventually they met in New York for the first of a series of discussions. The company had big ambitions, they said. They wanted to expand, to broaden the repertoire, to increase their already significant reach in the community. They were looking for someone who could lead them toward a more prominent place both within and beyond the nation's capital. They were drawn to her name, of course, and her international reputation and connections. But they were also “seeking someone who understood the importance of building an institution," explains Sylvia de Leon, board chair of The Washington Ballet. In other words, someone who would approach the job with a vision for the long term, not just a name. They were impressed by her sense of loyalty—to her company, to her colleagues. Was it important that she was a woman? “It wasn't something we discussed as a committee or was a priority," says de Leon, “but, yes, it was of interest." Eventually, Kent was won over. The transformation involved a subtle altering of her definition of a leader: not “someone who tells people what to do, somebody who likes to be the boss," but rather someone devoted to serving the art form that had made her who she was. Isabella Boylston, whom Kent coached as Juliet and Sylvia this year, attests to her ability to help dancers find their way into a role. “She doesn't spoon-feed me," Boylston says. “She leaves the structure loose for me in some places so that I can make my own choices." By directing a company, Kent would be in a position to promote arts education, form the next generation of dancers and argue for the inherent value of art, beyond such ephemeral gratifications as fame or Instagram followers. “I want to be the reassuring voice that reminds dancers that at the end of the day, it's about the work. That is your reward. That's what you're left with." It made sense in other ways, too. Kent grew up in nearby Potomac and studied at the Academy of the Maryland Youth Ballet, under Hortensia Fonseca, who studied with Mary Day, co-founder of The Washington School of Ballet and artistic director of The Washington Ballet for more than 20 years. Kent's mother, sister and brother still live in the area. She and her husband would be able to move their family into a house, with a yard—something their 7-year-old daughter, Josephine, in particular, is excited about. 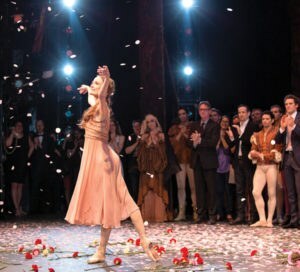 “The minute it left her lips" that she had been approached by The Washington Ballet, says Kevin McKenzie, Kent's boss at ABT, “I had a bittersweet thought: This is going to happen, and of course it should happen." Kent has started to draw up plans: Expanding community programs like the company's existing collaboration with THEARC (through which it provides training, a sliding-fee payment scale, classes for beginners and more). Building up the number of dancers from 21 to 40 so that the company can perform a wider variety of repertoire (her first hire was Cuban dancer Rolando Sarabia). Bringing in masterworks by the great choreographers of the 19th, 20th and 21st centuries. Using live music whenever possible. Finding a replacement for the director of the school, Kee Juan Han, who retired in April. And, of course, commissioning new ballets from internationally respected choreographers and introducing new choreographers to the DC audience. Her first program will be a 40th-anniversary event called Looking Back~Moving Forward. Another will include Balanchine's Allegro Brillante, Alexei Ratmansky's Seven Sonatas—she was in the original cast—and Tharp's Nine Sinatra Songs. In the spring, she hopes to put on Antony Tudor's Jardin aux Lilas and Frederick Ashton's The Dream, both of which she danced countless times. These ballets (which are all in ABT's rep as well) would then lead into future seasons, in which she'd like to introduce themed programs of English, Russian and American works. She's looking at ballets by Kenneth MacMillan, Balanchine, Jerome Robbins, Mark Morris—maybe even Merce Cunningham and Martha Graham. And after that, who knows? She would like to build a collaboration with one of the city's other large cultural institutions, perhaps the Smithsonian or the Shakespeare Theatre Company. “I want to try to create an atmosphere inspired by the Ballets Russes exhibition When Art Danced With Music," she says, “where you have the artists of the day designing sets and costumes to a new creation by the choreographer of the day with a new score." Her ambitions are not timid. “It's a big step to go from being a choreographer-led company to a company with an orientation toward building the institution and building audiences," says Sarah L. Kaufman, the dance critic for the Washington Post. “Until now, there's been an emphasis on energy and the new, and not always as much of an emphasis on refinement of classical technique." One of the reasons Kent is so confident that she can get this all done is that her husband, Victor Barbee, is coming with her. He too is a company man, having worked with ABT for four decades, first as a dancer, and, for the last 13 years, as associate artistic director. He'll have the same title in Washington; only his boss will change. It's heartening to see a husband prepared to play the supportive role in the workplace. By his own account, he prefers to get things done outside the spotlight, spending his days between the studios and administrative offices, “seeing to one detail after the next, refining and refining." Like any new opportunity, the move is a leap of faith. Kent has never directed a ballet company, planned seasons, courted donors, hired or fired dancers. But how will she ever know if the job suits her unless she tries it? “I gave myself the advice I would have given my children," she says. “You have to go for it."